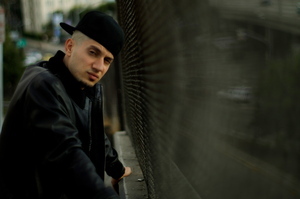 Omar Offendum was born in Saudi-Arabia and grew up in Washington and now lives in Los Angeles. He began his musical career as member of the arabic-american Hip-Hop group N.O.M.A.D.S. Omar Offendum is committed to supporting humanitarian aid for Palestine. His street performance and poetry projects have been reviewed among others by the BBC, ABC News and Al Jazeera. With “#Jan25” he created the viral soundtrack of the Egypt revolution. His current album was released in 2010. The Syrian-American rapper Omar Offendum was behind the popular song, “#Jan25,” a collaboration by international rappers inspired by this year’s protests in Egypt that quickly went viral. He sat down with Cora Currier to talk about the intersection of hip-hop, new media, politics, and his role as a bridge between the Western and Arab worlds.